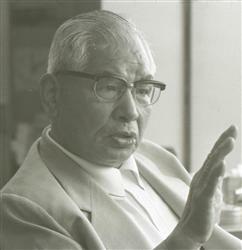 Shoji Nishio was one of the major post-war students of Aikido Founder Morihei Ueshiba O-Sensei. 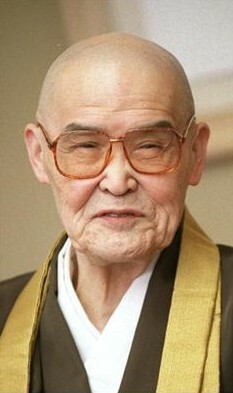 Born in 1927, he entered Aikikai Hombu Dojo in 1952, becoming one of the early students of the post-war era. Q: Why has the substance (of Aikido technique) been lost? A: Nobody listened to what O-Sensei was saying. They just tried to remember the outer form of the technique. Even though O-Sensei said “What use is it to just copy my technique? If you do a technique once it’s already finished.”. Because he spoke like a Kami-sama (God) they thought that nothing he said could be understood, and didn’t even try to pay attention when they were listening. Much later on when they’ve forgotten everything sometimes they’d remember “Ah, so that’s what that meant”. That’s why most people’s practice today is empty. They don’t look at other types of Budo. Right from the start, the value of a Budo is determined by comparisons with other Budo.For the most part, if you set up Kokyu-ho between two Aikido people it’s just useless. That will only be effective in the dojo. I guess that those people say things like “Even though you do Aikido you’re also doing Karate and sword. If you want to do Karate then go to Karate. If you want to do the sword then go to Kendo. 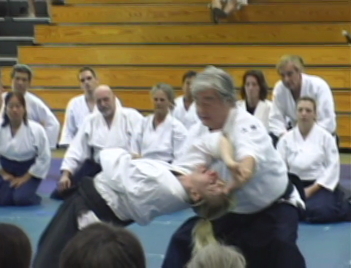 If you’re doing Aikido you don’t need to do other things.”. Even in other Budo, everybody is working hard, you know. When we see that we should make an effort to surpass them with our Aiki. That is the mission of Aikido as a Budo. Unfortunately, the senior students who had that as a goal are gradually dying away, and the loss of substance just progresses.The re-education of the younger instructors is necessary for people in the present time who would have the goal of reconstructing (Aikido) as I have discussed. This is not something that can be done in a single morning and an evening. Because this is a path that takes 30 or 40 years, I grow increasingly concerned for the future. 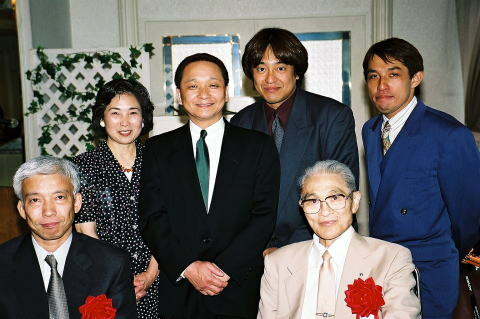 What follows is the English translation of an interview with Shoji Nishio sensei that took place at the Warabi Aikidokai on February 9th, 1999. You may also be interested in his book, “Yurusu Budo“, available in Japanese and English. Starting Aikido while training in Karate. 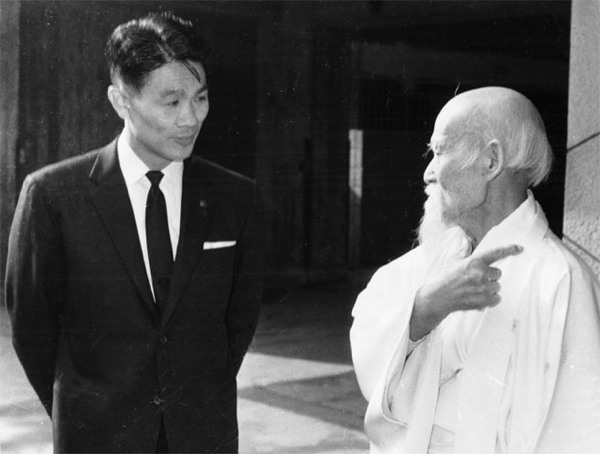 Q: How did you come to start Aikido? A; It was in Showa year 27 (1952), there was this place that was introduced in the Karate dojo, so I went with two of my Karate friends to Hombu Dojo. We couldn’t find it, even though we searched for half the day. At that time Nuke Benten, where Hombu Dojo was, was a residential area. When we went to the Koban (Police Box) to ask we were told that there was no dojo in the area. While we were searching the area wondering if we had made a mistake it became pitch dark. Just then we saw a building with a coffered ceiling through the bushes. Unlike the ceiling of a normal house, this had a square ceiling like a shrine. When we got closer we saw that it had a stone gate. We thought that this must be it and walked towards it, but it was already too dark to read the lettering on the signboard. We couldn’t read the lettering, but we could see that it was the signboard for a dojo. Anyway, we when we entered, that was the case. The lights in the dojo were just bare light bulbs – only half of it was covered with tatami. Worn out tatami – the bare boards were showing through. 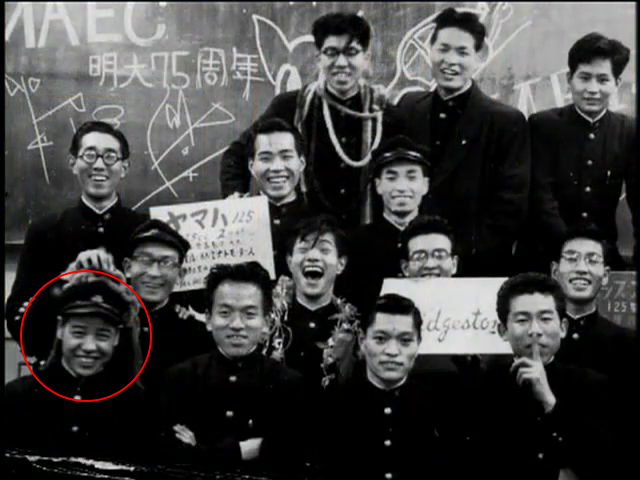 At that time the Second Doshu was called Waka Sensei, he was still employed at a securities company. Even though the dojo looked like that we said “Onegaishimasu” and went inside. Kisshomaru Sensei’s wife came out and said “Nobody’s here yet, so please wait for a little while”. So we waited. Even though only two or three people showed up. After a little while Waka Sensei showed up and said “Please wait, I have to go change”, and we said “Well, that’s OK, we don’t even know if we want to join or not yet”. That’s what it was like. Seigo Yamaguchi-san (山口清吾) and Hiroshi Tada-san (多田宏) were there. Well, I signed up right away, but my Karate friends that came with me said that they would do Karate for a little while longer and decided not to sign up. Before Karate I was doing Judo, but I decided to quit Judo altogether and do Karate and Aikido. Q: So the first thing that you saw was Kisshomaru Sensei’s class? A: That’s right. I watched the class, and then the next day when I went to watch again Tohei-san (藤平光一) was there. Because of that I started feeling like I wanted to try it and signed up. 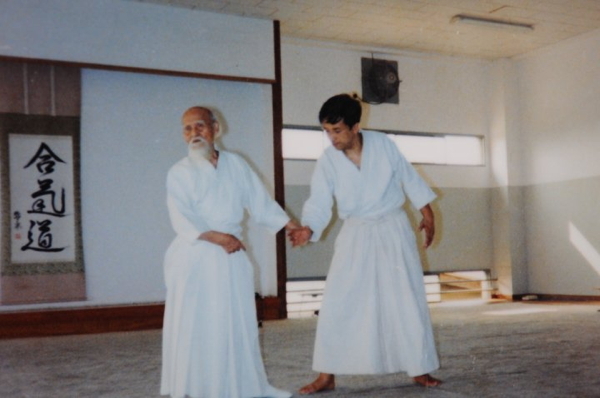 Q: At the beginning how often were you training in Aikido? A: I went to Karate first. Aikido training started at 7:00, so I’d leave the government office when I finished at 4:30 and go to the Karate dojo in Hamamatsu-cho first. Whichever dojo you go to they never end on time, so there would be people training for about an hour after the regular Aikido class finished. I’d go in time to slip into that training. Q: So you were a real dojo-hopper, weren’t you? A: Yes, I was. (laughing) It was the same when I doing Judo and Karate, it was common for me to train about five hours a day! On my way home I was so exhausted that I just wanted to lay down flat on my back in a field and go to sleep. Those are the memories I have of that time. Q: Who made an impression on you when you entered Hombu Dojo? A: I felt drawn towards Yamaguchi-san. He was the one. He was like an older brother. Yamaguchi-san was a high school teacher, but he threw that away to come train. Well, you could say that he was the first professional in Aikido. I was a civil servant while I was training, so I was just training as much as I liked, and I felt guilty if I didn’t help out. Just at that time the Yoshinkan was started, and I guess that everybody begged Waka Sensei to leave his job. He quit even though he was a section chief (課長) and became an Aikido professional. So I thought that I had to do something to help and started an Aikido club at the Bureau of Engraving and Printing where I was employed. The Aikido club at the Bureau of Engraving and Printing is the oldest Aikido club for working people and students in the Aikikai. It was established in November of Showa year 29 (1954). The Todai Akamon (東大赤門 / Tokyo University Red Gate) club was started one week later. 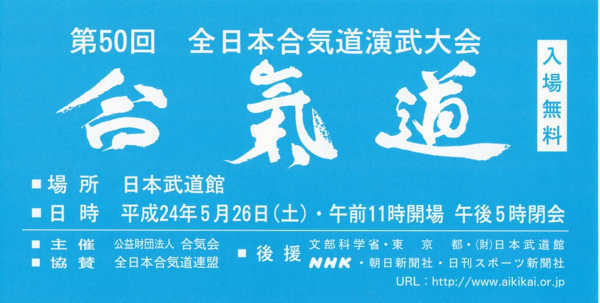 That club was the start of the Student Federation (全国学生合気道連盟 / All Japan Student Aikido Federation). Q: At that time there still weren’t very many people who knew of Aikido, how did you attract students? A: The Bureau of Engraving and Printing had Takinokawa and Oji factories in Kita Ward. At that time there were about 27,000 or 28,000 people at the Takinokawa factory and about one thousand at the Oji factory. It was a major industry for Kita Ward, and it was also a government office. So of course I received appeals from the Kita Ward Judo Federation to start a Judo club. 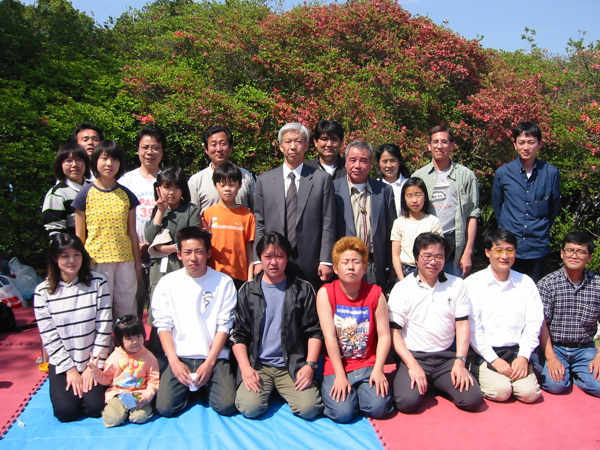 Well, I said that I was starting a Judo club and started to recruit people. Of course, nobody knew what Aikido was at that time, but the people were already gathering together and at some point I became the manager. Once I popped a Nikyo or Sankyo on the lot of them they said “Hey, that works!”, and it was simple to convince them that this was better. See? You don’t need difficult explanations! Because it works. (laughing) So they decided that this way was better. When we started we had 85 or 86 people in our youth group and about 80 in our children’s group. 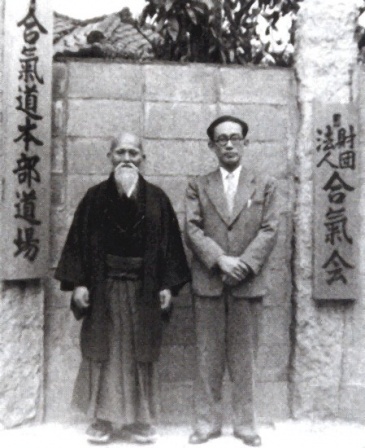 The Founder and Waka Sensei both came to those classes. Yuji Sakamoto-san (坂本友次, currently chairman of the Kita Ward Aikido Federation) would go to wash O-Sensei’s back in the bath after training. Kisshomaru Doshu’s activities were listed chronologically in the newspaper the other day (Aikido Shimbun, January 20th 1999). 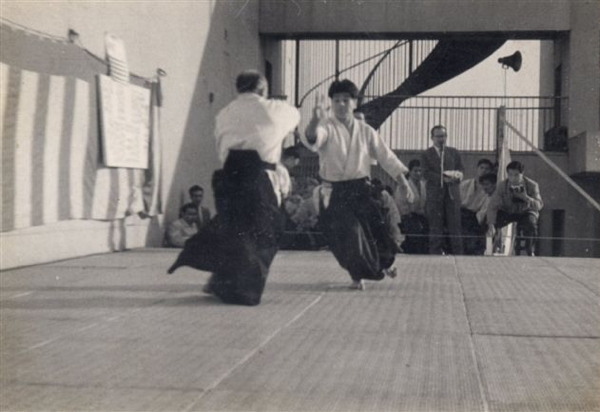 It said that the first All Japan Aikido Demonstration was held in Yamano Hall in Showa year 35 (1960), but there were actually other groundbreaking events that were held before that. In Showa year 30 (1955) the ambassadors and ministers from many countries were invited to five days of demonstrations on the rooftop of the Takashimaya Department Store. This was the first demonstration ever given in public. For that reason, it was touch and go whether or not O-Sensei would allow it. At that time O-Sensei felt “Budo is not something that you show in front of people”, so Waka Sensei had to work hard in his appeals. We didn’t know if he would allow it or not, or even if he would be willing to participate. That is, it wouldn’t look very impressive with just us demonstrating so somehow we needed him to come out. I think that Waka Sensei went through great trials with these problems. For that reason Kisaburo Osawa-san (大澤喜三郎) and the rest of us appealed to Yoji Tomosue (Translator’s Note: 友末洋治, Governor of Ibaragi and instrumental in the founding of both the Kobukai Foundation and the Aikikai Foundation). In any case, O-Sensei told us something like “Do what you want! See if I care!” and we were able to proceed. However, even though he yelled at us I think that he couldn’t just sit by and watch what the young people were doing, so he decided to appear himself. That’s how the demonstration came into shape. I believe that it is because of that demonstration that the first All Japan was able to be held. At the time all of the old students from the provinces, from Osaka to Kyushu, came running to help. I borrowed a bus from the Bureau of Engraving and Printing Aikido club and about forty men and women came to participate each day in outings from the government offices. Q: With the development of the Aikikai the Bureau of Engraving and Printing Aikido club must have flourished as well. Well, there also times when things didn’t go so smoothly. There were children, and there were times when I thought that it was just enough, that I should just devote myself to my work. Around then, Kisshomaru Doshu invited me through Yamaguchi-san to go drinking. Below Otowa Goten (音羽御殿) there was an old red-light district where Daikichi Terauchi (Translator’s Note: 寺内大吉, a Naoki Award winning author, sports writer and Jodo Buddhist priest), Doshu, Yamaguchi-san and I went drinking three or four times. It’s not like one discusses complex topics when drinking, but I thought that I had a heart-to-heart communication (以心伝心) with Doshu and he understood how I was feeling. So then I decided that I couldn’t quit, and resigned myself to my fate. Both Doshu and Yamaguchi-san have already passed on though. Q: How were Doshu and Yamaguchi Sensei at putting away drinks? Yamaguchi-san didn’t chug down his drinks the way a heavy drinker like me does, but he kept up! It’s not that he disliked it, but he didn’t drink heavily. That’s why it’s so strange. Yamaguchi-san watched his health with things like that brown rice diet, so even though Yamaguchi-san was older I thought that he would live on after I died. In spite of that, he went on ahead. Doshu stopped drinking very much because he had a major operation, but according to the lawyer Maeda-san he was once like a drunken Shoin Yoshida (Translator’s Note: 吉田松陰, one of the key intellectuals of the late Tokugawa period), once he started drinking there was no end. (laughing) Well, he could really drink a lot! One entire wall of a six tatami room in Hombu Dojo was used for shelves with alcohol stacked up to the ceiling. When I when I went to visit on Sunday he would ask “Nishio-san, do you have to go already?”. At that time there were three brothers doing Aikido who lived nearby Hombu. The oldest brother was the Sakamoto-san from Kita Ward that I mentioned earlier. I have many memories of going over to visit them – Doshu would choose some alcohol from the wall and say “Let’s take these with us” and off we would go! Thank you! A wonderful read. Cheers! Thanks Magnus, I’m glad that you enjoyed it! Provocative article. Especially about the goal is to surpass other budo with aiki and Nishio sensei’s concern for the original substance of aiki. Thank you for posting it! Thanks Brian, glad that you found it interesting (I did, too 🙂 )!